In February, the Board of Trustees approved the framework for a new strategic and master plan. These plans include redefining the university’s mission, values and virtues, as well as looking at how to best implement its physical space. “It’s a structure upon which we’re going to keep building things,” Bill Mea, vice president of business and finance, said. The strategic plans are currently being implemented as specific language is shifting, whereas the master plan may stretch across a 20-year horizon. Purpose-Ready: Focusing on ethical leadership, cultural diversity and civil discourse programs. Originality: Developing programs to create intentional inclusion, student empowerment pathways and contemporary living and learning. Health and Well-Being: Concentrating on student health and that of the community and looking at ways in which future health professionals are educated. Columbus: Engaging fully with opportunities in the community and developing partnerships. Programs such as the Bonner Leaders and the Active Aging seminars have recently been established and fall within the realm of the new strategic plan. 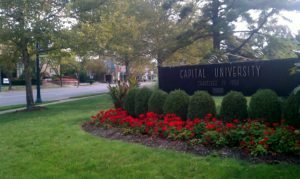 In addition to the changes of the strategic plan, campus may begin to see some physical changes in the coming years. These changes could include new residential halls, parking lots, sports fields and mixed-use buildings. The addition of a health, well-being and science building where the Commons are currently located is also being proposed. According to Mea, this building could have multifaceted programming, including both a living and learning space. It is possible that Capital would partner with an external developer to create, for example, a residential care facility for the elderly. Mea said that this would directly allow the nursing and some science programs to utilize this area for educating, internships and training. Capital is also looking at utilizing the river front of Alum Creek to create more outdoor spaces. The creation of more green spaces is also the influence behind trying to move parking towards the outskirts of campus, which would free up the central area to be “activated” by students, according to Guegold. Parking could be placed behind the houses on Sheridan Avenue and on College Avenue, in addition to the large S lots on Pleasant Ridge Avenue. Funding for the master plan will come from several different channels, including partnerships with developers, borrowing, fundraising and possible new revenue streams, similar to the retail apartment complex that is to be established near the law school. Improving residential facilities will be the first step in implementing the master plan. This will begin this summer with renovations, though we will not see any new major construction for at least a couple years. One of the other early steps will be working towards the creation of the health, well-being and science building.